My personal goal is for FabEllis to become my main source of income. I know that with that there will be a lot of planning and work involved. To get focused, I decided it would be best to have a dedicated space in our home to be able to focus and work on my goals. It was time to create my personal home office. 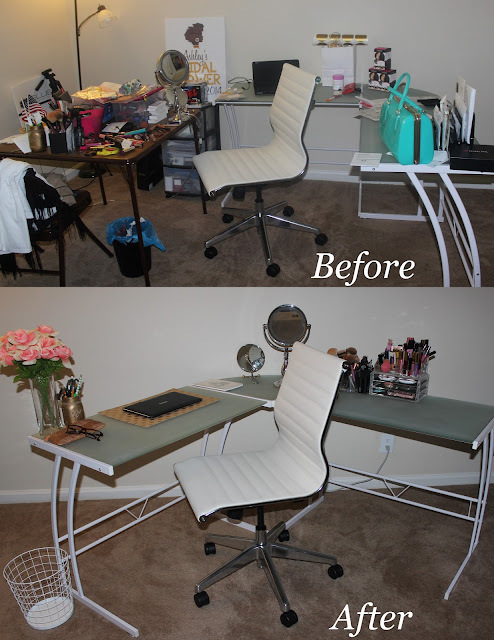 Creating my home office wasn't easy, but I loved the process! Part of the process of creating my home office being a bit tough was because after moving in with my husband last year, I still had boxes that weren't unpacked not to mention my makeup area was an absolute mess. I thought it best to have a multi-functional office area that allows me to do work on one side and makeup on the other. I love this desk because even if I choose to create a separate makeup area in the future, it's great to have two ends of a desk to work on. What do you think of my office space? Is a home office a must for you?